Before we start, I want to make it clear that I really don’t have a problem lying to children: I’m not coming at this from a high moral standpoint; it’s just that I think we could all make our lives much easier if we established a party line when it comes to S-A-N-T-A. 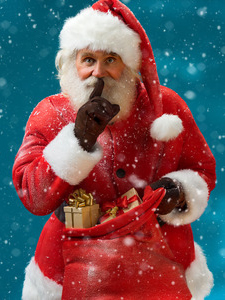 So, we all know that the ultimate purpose of the bare faced lie that is Santa is to use as a loaded weapon against bad behaviour create a magical Christmas experience for children, and yet we all do it differently. In some families, Santa and his team of elves make all the presents in their workshops and deliver them to children on Christmas eve. In some, loved ones buy the presents and send them to the North Pole for Santa to distribute as he sees fit. For some, presents come wrapped in special Santa paper. Some say Santa is just omnipresent and watches all children at all times, some say it’s the elves and some claim they watch via the burglar alarm sensors (?). Many say he comes down the chimney but some don’t have chimneys so he has to come through the window. Some even go as far as faking snowy footprints on the carpet (which is quite frankly just creating more unnecessary work for yourself). We all have different explanations for the pseudo Santas in grottoes and explaining how he visits all the children in one night never makes sense to anyone (and is invariably written off as generic ‘Just magic. Stop asking questions’). Personally, I don’t want some imaginary dude taking the credit for the money that we’ve earned, saved and spent and the hours spent shopping for the most perfect gifts, so in our house WE buy the presents and leave it to Santa to judge whether the little angels deserve them (with a word in the ear and inside intel from us, obvs). This is, however, in direct contradiction to the suckers who let Santa have all the kudos – with kids in the same social circles who my kids actually talk to about this stuff, putting me in somewhat of a pickle when I have to explain this under cross examination. None of this adds up, most of it contradicts itself and all of it spins a plot more cryptic than a clue on 80s game show 321. Besides, have you ever known even the most horribly behaved kids NOT get their presents on the big day? Based on all this I have come to the conclusion that kids are either (a) stupid or (b) evil geniuses who completely see through the b*! ?$^t and play along with it in order to watch us twist ourselves in knots, revelling in the blind panic when they ask a seemingly innocent question such as “why didn’t Santa know that I would get 3 of these?”, “how come Santa left these presents at Grandma’s?” and “if Santa made this for me, how come you can take it back to Marks and Spencer’s?”. My children aren’t really so little any more so we now have a believer and a Seriously-Mum-I’m-10-Do-You-Think-I’m-That-Stupid non-believer. After 10 years of my pants being on fire I think I will be relieved when it’s all out in the open and I no longer have to pretend. I would consider just telling the younger one to be honest but I reckon I can milk the ‘Santa’s watching through the alarm sensor’ behaviour modifier for at least another year.